This article represents concepts and code samples around Angular 2 Components which resides at the heart of the Angular 2 framework as like Controller/Scope which resided at the heart of Angular 1 app. Please feel free to comment/suggest if I missed to mention one or more important points. Also, sorry for the typos. Components are at the heart of Angular 2 apps. A component in Angular2 is used to represent a View along with associated logic (encapsulated as a Class), which will get executed based on interaction with that view. Additionally, a component could call/invoke one or more services which can be “dependency injected” into it. The top-most component is termed as “Marksheet”. 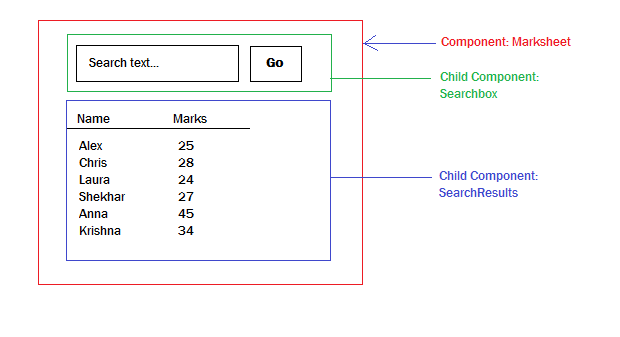 The marksheet component consist of following two child components. SearchResults component which is used to display search results. This could internally have a set of child components such as SearchRow representing each search record. Does the above resemble like Angular 1 directives. Well, simply speaking, Angular 2 components is nothing short of Angular 1 directives. An associated view is annotated with @View annotation. At the end, the bootstrap function is invoked to start or bootstrap the angular application.